Men who work in PR and marketing can earn on average nearly £34,000 more than women if they reach senior roles, new research has revealed. A study by recruitment firm Michael Page shows that among the top 20 per cent of earners in PR, the average male salary is £101,994, while their female counterparts earn an average of £68,204 per year – a difference of £33,790. 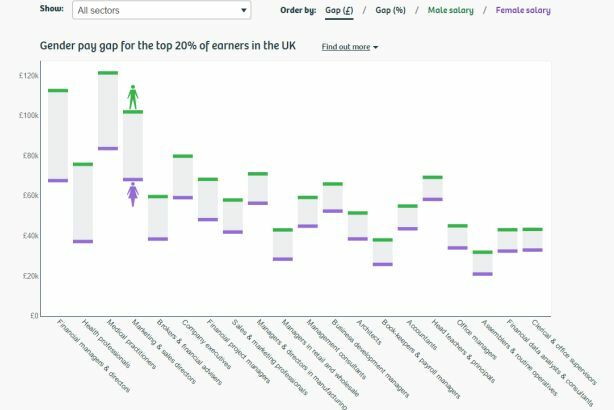 This is one of the largest top earner gender gaps, behind only the gap for finance, health and medical roles. In addition, the average salary of all males working in PR and marketing is £60,000, compared with an average female salary of £42,228. This is a pay gap of £17,772. The findings are based on results from the Government's ONS Annual Survey of Hours and Earnings, 2014. In a separate survey carried out earlier this year by recruiters The Works Search and Selection, there was an even greater disparity in pay within financial PR, where women from in-house roles received nearly £90,000 less in bonus payments than male colleagues in similar roles. Speaking about the gender pay gap earlier this month in a PRWeek analysis on the topic, Vikki Chowney, director of content and publishing at Hill+Knowlton Strategies, said she had seen countless studies of this kind over the years and thought the pay gap persisted partly because junior women entering the industry were unaware the problem existed. She said: "The conversation about this issue with women in senior roles is totally different to one with someone at entry level. There’s so much data out there about this but it’s still not making its way into degree courses or when people are inducted into the industry and I fundamentally believe that it is why the problem exists."